Bathed in the water colors of Quebec's North Shore and pillowed with forested plateaus, Tadoussac is a nature-lovers' dream. 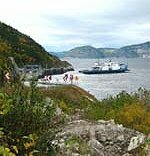 It's the spot where clouds touch waves and the rambling St. Lawrence River joins the rocky Saguenay Fjord. The wild vastness of this landscape is softened by clusters of warm cafés, artisan shops and pastel-colored cottages.